Nicholas and myself would like to wish our readers a very Merry Christmas! We would also like to take this opportunity to thank all of our customers who commissioned portraits from us in 2017. We wouldn’t be here if it wasn’t for you all. Thank you so much for supporting our blog and signing up to our newsletter. This year we have received some beautiful and heartfelt emails from our readers, letting us know they look forward to reading our newsletter each week. How fabulous is that!! We are so thrilled to hear from everyone and we love reading everyones comments that are left here too. As you can see the image above shows one of my hand made Christmas cards. I have only just recently ventured into the world of stamping and decided that my first foray into having a go at the craft would be to make a few hand made cards for friends and family this year. I am quite hooked and hope to have more time next year to experiment further. The range of coloured inks and wooden stamps available are amazing. I’d love to have a go at making my own stamps in the future. Both Nicholas and myself are taking bookings for our oil and pencil portraits into April / May of next year. With a holiday in April planned too, we know that the start of 2018 will fly by. We will of course be adding lots more blog posts. If there is anything you would like us to specifically blog about or feature here, please do let us know. We wish everyone a very Merry Christmas and A Blessed New Year! 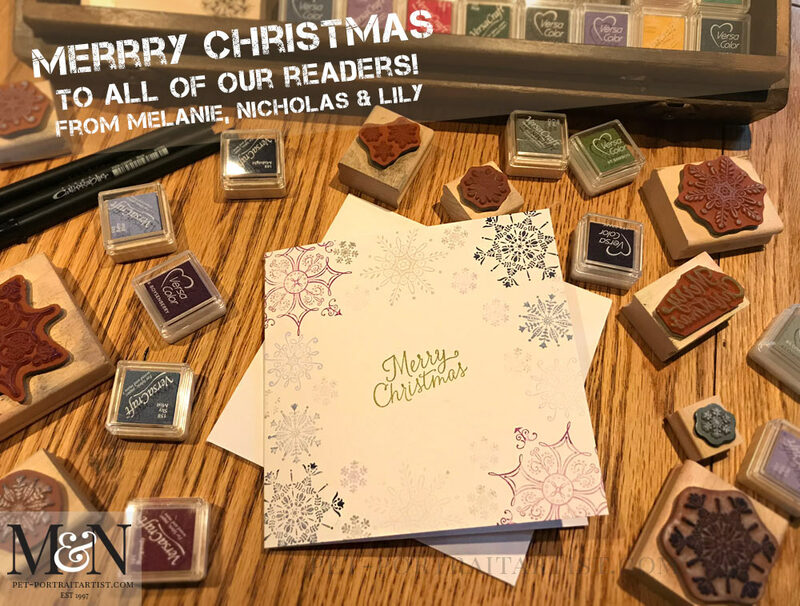 Merry Christmas – Join our monthly newsletter! And a Merry Christmas to you both! Thanks for this fascinating newsletter and for being an inspiring part of my life.